This is a continuation for the Life as a Badger blog series – where I try to sum up as much as possible about my 4-years of studying in the US in all aspects, from academics, finances, travel & trips, and work, leadership and volunteer experiences. You can read Part 1 of the series here -> Part 1: Academic Life, where I wrote about what I studied, the classes that I took, and some thoughts on what I’ve learned or enjoyed about the US education system. This second part, as you can probably guess from the title, will be mainly on my main source of funding: MARA’s sponsorship (or partial-sponsorship, as it is technically a convertible loan). Alhamdulillah, for the duration of my 4 years in the US, I was funded by MARA, so I didn’t have to worry about my tuition payments, my monthly allowances, my health insurance and whatnots. As you can see, my total loan from MARA is actually RM696,827.01, but my ‘repayment amount’ (as of today) is RM671,452.01 . This is because my one year of ADFP in INTEC Education College was a full scholarship, meaning that once I’ve successfully completed my ADFP in INTEC and flew off to the US, I won’t have to pay MARA back for the one year of foundation studies. So that includes INTEC’s tuition payments as well as my monthly allowances during my time in INTEC. I have already went to MARA’s office in KL to report that I’m back home in Malaysia, that I successfully (Alhamdulillah) completed my studies in accordance to my agreement with them. I’ve already applied for conversion (which is basically applying to lower the amount I have to pay back to MARA), and am now waiting to hear back from MARA about my repayment schedule and for them to update the ‘repayment amount’ based on my final grades from Madison. 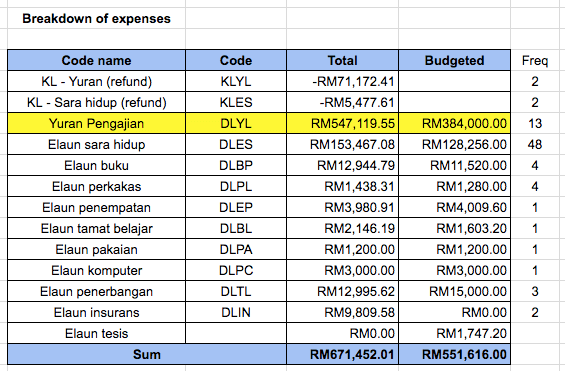 Now, to the nitty gritty behind the RM671,452.01 that MARA spent on myself, and where did the money go. The data above was collected from (1) MARA’s eBaki system, where MARA sponsored students can check their allowances and any payments MARA has made on their behalf, and (2) the budgeted breakdown of MARA’s sponsorship that was provided to me along with my sponsorship agreement / contract. A huge chunk of the money goes towards my tuition fee payments, and the others are made up of my monthly allowances (2nd huge chunk) and other annual allowances (books and appliances, etc). Changes in exchange rate, since the budgeted expenses was based on 1USD = MYR3.20, which was the exchange rate in mid-2013. The exchange rate at the end of my 4 years in the US has increased to about 1USD = MYR4.30+, so that affected the actual amount that MARA paid for my fees and allowances. Changes in tuition fees. Tuition fees for international students in the U.S. is not cheap, and my university actually increased the tuition fees over the past four years (as you can see from the table below). Though the increase in USD is only about almost 30%, coupled with the increasing exchange rate, this led to the tuition fee payment to be almost doubled in MYR (from RM44k per semester to RM77k per semester). Also, MARA didn’t actually budget anything for health insurance payments, as some universities actually include the cost of health insurance premiums into the tuition fee payments. 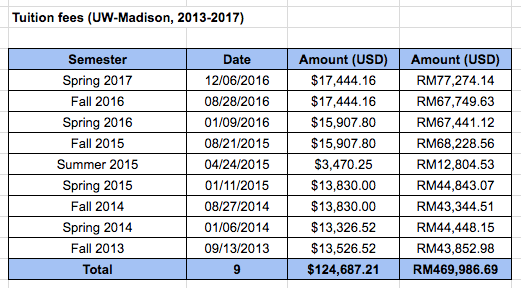 However, for UW-Madison, all international students have to purchase the university’s student health insurance, which costs about USD 1.2k yearly. You would see that there’s only 2 instances of DLIN in the table, and wonder why there’s only two payments, whereas I stayed there for four years, and would naturally have paid 4 health insurance payments. I was wondering this too, until I realized (just recently) that two of my insurance payments (in 2015 and 2016, for my 3rd and 4th year) was categorized under DLYL (tuition fee payments), which also answers the question why there are extra two payments for DLYL (there are originally 13 payments for DLYL, two of which were ‘refunded’ again through KLYL, but I only have 9 semesters, so there’s an extra 2 payments of about RM4k each). So that made sense, although it was somewhat confusing at start because I was scratching my head like hell trying to figure out where those extra payments went to. I also did not have to write a thesis as part of my degree program (the Business program is strictly coursework only, so no thesis or dissertation or final year project to do), so I did not use up the thesis allowance at all. My monthly allowance from MARA is USD 835.00 (that’s Rate C for monthly allowances). Housing in Madison is bloody expensive as compared to some other places. A shared, unfurnished room can cost you like $350-450ish, while getting your own room can cost you $500 or more. My third and fourth years were spent living alone in a studio, which cost me about $750 monthly (rent + utilities + internet connection). Now, note that the decision to live in a studio was a personal one, as I wanted to experience living by myself and being fully independent, so it was my own call. So I knew that it was going to cost more, and fully accepted that. What helped tremendously was the fact that I worked part-time while I was a student. I will go into more detail about my working experiences in the US in another part, but for now, suffice to say that the salary I earned from my part-time job(s) helped me to cover my expenses, as well as allowed me to travel to other states in the US during my breaks. Do note: This is an estimation, mostly because my payment for utilities and groceries differ each month, depending on how much I use or how much I cook at home. My savings part include my savings for any travel / trip I wanted to do (i.e. our winter cruise trip to Mexico) and all. The trip/travel also includes my (almost) monthly trip down to Illinois to see him, so it covers my Hertz car rental, toll & gas. Oh, and obviously shopping depends on the month, as some months I’ll spend more on shopping (i.e. Black Friday, Christmas sales, early of the semester with new textbooks and all). So how much amount u have to pay after some deduction? According to my contract, 15% of the whole amount, which comes down to a little over RM100,000. Next post	2018 - A Year of New Beginnings.